There are 101 things they don’t tell you about how your life will be changed when you start doing triathlon. There’s that moment of heart-in-the-mouth trepidation when you sign up for your first race, not sure that you are fit enough or will ever be fit enough, and then a couple of months of frantic thrashing in the swimming pool and the training rides and remembering what it’s like to run because the only running you’ve done since you were a kid is running for the bus. We all get that. That’s expected. Then there’s the sudden crazy spending on esoteric training kit followed rapidly by the loss of social life, the obsession about getting your shoes on faster than should be humanly possible, the endless tinkering with race nutrition; not to mention the slow descent into carbon fibre and neoprene and compression panelling. They might not tell you about that up front but, if asked, people will nod sagely and agree and say it’s just part of doing triathlon. 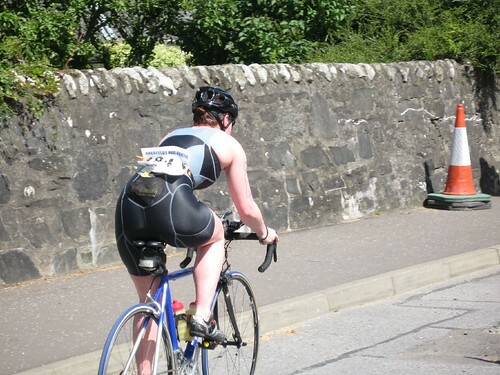 [Flickr] lycrafetboy2000 added your photo “East Fife Tri 08 End…” as a favorite! Initially there’s a sort of smug, self-congratulatory feeling that someone favourited a photo. Then your brain registers the username. Then you start to realise that it’s not the photography skills on display that has attracted the user’s attention. And it’s probably not an interest in the sport, either. And, despite yourself, you find yourself clicking on the username, then following the link to his (it is ALWAYS a him) profile. Then, oh and then you discover that he’s a member of such groups as “My wife’s hairy front bottom” and “Girls in lycra” and “Spandex Fetishists Unite”. And you feel faintly dirty and want to take a long, hot bath and scrub yourself clean. A friend of mine suggested I block these users, or set all my photos to limited view. I don’t want to set my photos on limited view and blocking the users won’t stop new ones coming along (I said COMING). It’s not like they’re forcing me to watch them fapping to photos of me on my bike, after all. The worst thing of all is that it’s not so much that I’m offended or bothered by the thought of sweaty men pleasuring themselves, grunting over an image of me on the screen. It’s just that… Well. So many of them are so indiscriminate. I should stop looking at their profiles because then I wouldn’t know into what set I’d been placed in the “Total stranger on the internet finds these things fapworthy” category. I really should. Just stop.